Don’t you hate it when you’ve seen a film years ago, in this case when it was originally released and you can’t remember anything about it except the plot. So, you get the opportunity to catch it again and then realise why you don’t remember too much about it in the first place. 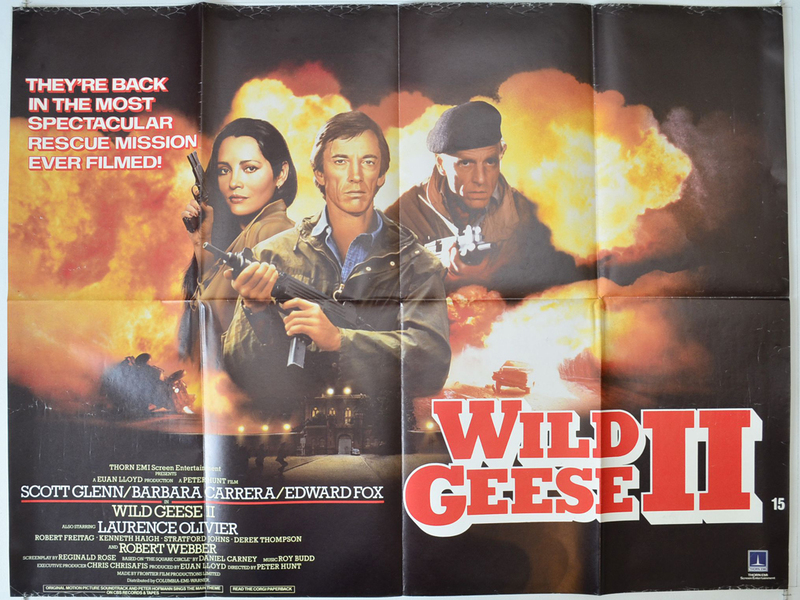 That is exactly what happened with Wild Geese II, a completely non-connected sequel to the 1978 action adventure, The Wild Geese. An American television network has comes up with an idea that will really put them on the map. An interview with Nazi Rudolf Hess, who is residing in Spandau Prison in East Berlin. First they have to get him out so they hire mercenary John Haddad to lead a team to break him out. It’s not as easy as it first seems and with fellow mercenary Alex Faulkner at his side, the men must deal with the Germans, Russians and British who all want a piece of the action. The original Wild Geese was a total piece of hokum made so much better by having a terrific cast. Richard Burton, Roger Moore, Richard Harris all brought something to the game that made it more than just another violent action adventure with a few decent set pieces. Here, none of the actors returned (Moore and Burton were to return but Moore didn’t like the script and Burton died. Incidentally, the film is dedicated to him). 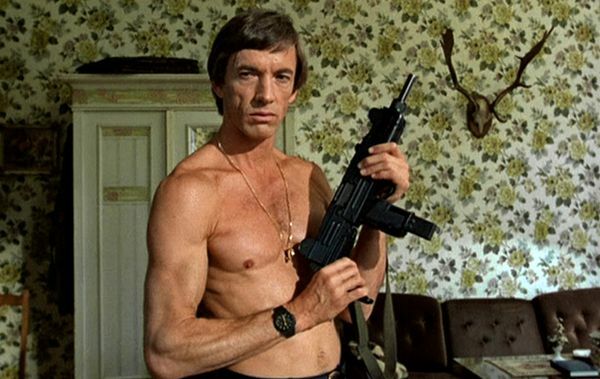 So to replace them, they brought in Edward Fox, playing Burton’s brother (the only connection to the first film) and Scott Glenn, who up to then was just another jobbing actor who had starred in a few low budget action films and really made his name as Alan Shepherd in The Right Stuff. Add to the equation, Barbara Carrera, giving the film it’s glamour. Carrera, up till then, was famous for playing the bad woman in the James Bond flop, Never Say Never Again and went on to star in Dallas for a while. Peter Hunt, who had made an outstanding job on the Bond film, On Her Majesty’s Secret Service, seemed to be the perfect choice as director. He handled the action sequences in that film brilliantly and most regarded it as one of the best. However, here his direction is less than exciting and what we have is a laden, slow paced and rather dull film which occasionally comes to life with a few decent action sequences but nothing that can really save it from being, well, boring. It has the feel of a TV movie, looking like an extended episode of The Professionals and with the inclusion of some familiar faces from British TV and film; Ingrid Pitt, Derek Thompson (Charlie from Casualty) and Patrick Stewart, who has famously said this is the most embarrassing role he has ever played and regrets doing it. It doesn’t help that Glenn hardly gives the film any life. As the leading man, it’s like he is sleepwalking through it. Glenn, as we know from his later work, is a strong actor who gives good performances but he certainly off form here. Fox, a stalwart of British film, more famous for The Day Of The Jackal, was given lines that were originally written for Burton, only the character name was changed and the romance between Glenn and Carrera is far from electric. In fact, it’s one of the worse love scenes on film, lacking in emotion or eroticism. Laurence Olivier, as Hess, looks the part but this is obviously a man who is very ill and very frail. Reports state that he couldn’t remember his lines and his big scene took forever to film. Sad really, that a man of such magnitude should be even allowed to appear in a film so dull. While the premise is an interesting one, the execution is laboured. It takes forever to get anywhere, with a bunch of meaningless subplots about who is in control of Spandau Prison and training to become proper MPs just slows everything down. When the escape finally happens, you really don’t care that much. No wonder this film gets a rare outing. Best get your hands on The Wild Geese and enjoy it than looking out for this.